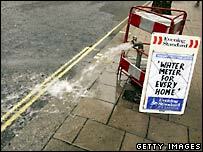 Thames Water has escaped being fined by regulator Ofwat for failing to meet its annual targets to reduce water leaks. Instead of having to pay a penalty, the company will invest an extra £150m over five years to replace ageing pipes. Thames was expected last year to cut its average daily leakage rate to 860 million litres, but only managed to reduce it to 894 million. The firm has missed targets three years in a row, and has been criticised as water supplies fell and profits rose. Thames recently applied for a drought order, and also has reported a 31% increase in profits and bonuses for some of its top executives. The money the firm is being told to invest by Ofwat is twice as much as the fine the regulator could have imposed. "A fine would not have gone to protect customers, but to the Exchequer," said Ofwat in a statement. "Thames has bound itself to spend an extra £150m at the cost of its shareholders to replace more ageing pipes than planned. This will directly address the issue of London leakage and achieve more secure supplies," said Ofwat. The investment will go towards replacing at least 368km of mains pipes, in addition to the 1,234km that the firm is already committed to replacing between 2005 and 2010. Ofwat has set new leakage reduction targets, saying that by 2010 Thames will have to meet levels that are 20% harsher than the earlier ones. However, critics have complained that in the years up to 2010 the targets, rather than getting tougher, have actually got easier. This year, for example, Thames will have to cut its daily leakage rate to 840 million litres, far higher than the earlier level of 805 million litres. Although it has reduced the volume of water being lost, Ofwat said in late June that Thames' performance was "unacceptable". Environment Minister Ian Pearson backed Ofwat's decision, saying: "It is right that the consumer does not bear the burden of the increased investment needed for Thames to deal with its failure to meet its leakage targets." Especially as Thames, which is owned by German utility group RWE, reported pre-tax profits of £346.5m during its last financial year. It also has applied for a drought order and expects to hear in August whether it will be issued. Not everyone was pleased with Ofwat's decision. Elizabeth Howlett, deputy chair of the London Assembly's Health and Public Services committee, was among the most outspoken. "It's insulting to suggest that merely redistributing huge profits borne by rising prices is any penalty for Thames Water's poor maintenance record," she said. "Disgruntled consumers, who are facing more and more restrictions, would've welcomed much tougher penalties and stricter targets on reduction levels, rather than letting Thames off the hook with this half-baked effort," she said. Pressure group the Consumer Council for Water said that while it welcomed the increased spending on the leaks, Thames' customers should be given a refund, or rebate, from their bills to compensate for the company's failures. "Thames took consumers' money without delivering on their promises - it is only right that they should give back what they owe to their customers," said Dame Yve Buckland, chair of the CC Water. Does Thames Water supply you? Are there leaking pipes in your area that have not been fixed?